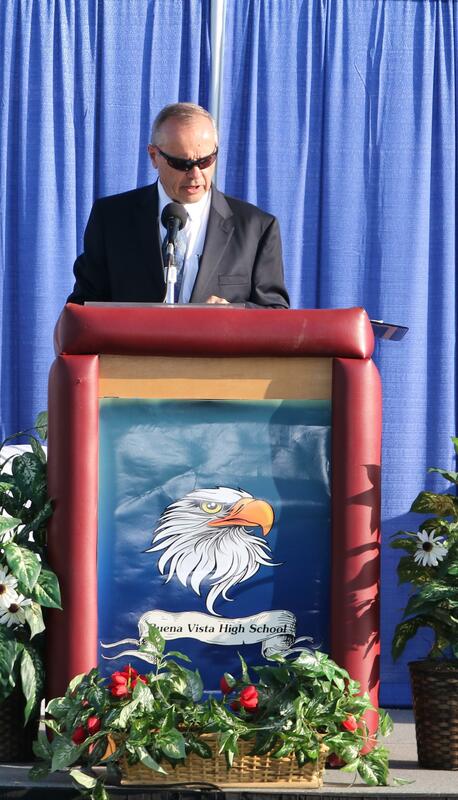 It is an honor and a privilege to serve the students and families of Buena Vista High School. Our District and school mission is to ensure learning and success for each student by providing a quality education. We will accomplish this as students, parents, teachers, support staff, and administration work together for a common goal. Our commitment to each student is to provide standards-based instruction, which is implemented by our highly qualified teaching staff that works as a professional learning community. Close collaboration between all stakeholders will ensure that we maintain high expectations in a safe, nurturing environment. Our school mascot, the eagle, symbolizes many things. Just as eagles freely soar through the skies our mascot is representative of our students' futures, which are limitless and full of possibilities. Each new day is a new opportunity to learn and soar to new academic heights. All students should be developing and refining their own life goals. We provide instruction via our guidance curriculum to support students as they plan for life after high school. Education is the key to unlocking many opportunities in life. The staff of Buena Vista High School is committed to the academic, social, and emotional growth of each student. We look forward to a very productive and successful year!